A suite of 24 samples were collected form the fosterville prospect in during an excursion organized by the bicentennial gold 88 conference. Sample locations are referred only to the excursion guidebook map as GPS was not available. The following description of the Fosterville geology is from the excursion guide book, compiled and edited by D.G. Jones. The Fosterville discussion is by G. W. McConachy, 1988. The Fosterville Goldfield occurs in sedimentary rocks of Ordovician age associated with the oxidized brecciated shear zones and associated stockworks of the Fosterville Shear Zone. There are few historic reports of visible gold and none of nuggets. Similar styles of mineralization occur in apparently related structures within the immediate district. These structures, steep major faults with apparent normal displacement, may be auriferous through supergene enrichment. The Fosterville Goldfield is situated on the eastern limb of the north-south trending structurally complex Strathfieldsaye Synclinorium within a turbidite sequence of marine greywackes, sandstones, mudstones, shales and slates of Ordovician age. Apart from the resistant greywacke-sandstone sequence forming the Sugarloaf Range, the Ordovician rocks are poorly exposed other than in mine workings. Graded bedding is common with the sequence and appears to be the most significant sedimentary structure. 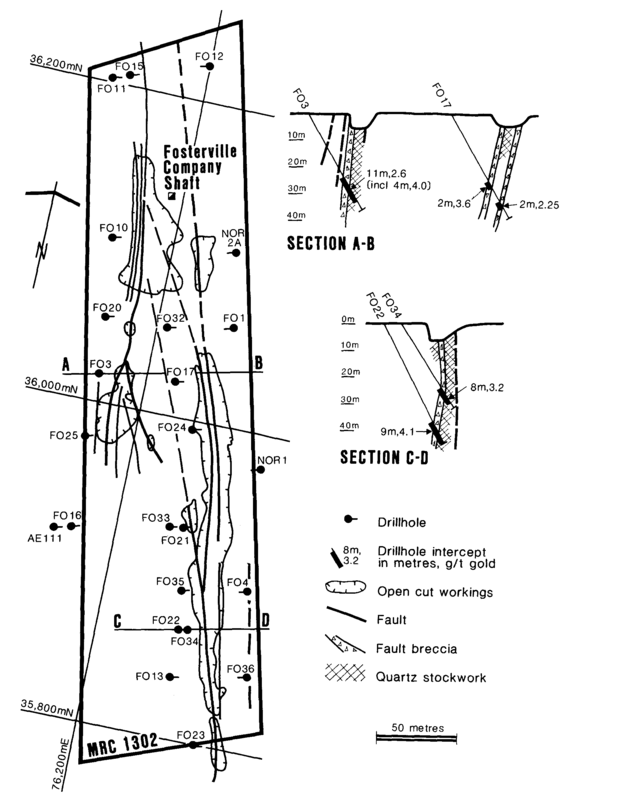 The sequence is characterized by tight to isoclinal folding with shallow plunge reversals and major strike faults, the most significant of which is the Fosterville Fault, a planar mineralized structure with significant mine workings over a strike length of 8 km (Fig. 1). The fault zone trangresses both fold axes and regional bedding at low angles, and is a complex feature consisting of shear zones and fault breccias of variable width. Splay faulting and associated shearing are common features. Minor drag folds occur in finer grained rocks near the fold axis, which suggest that some normal faulting (east block down) has taken place. Irregularities in the normally linear workings may reflect the presence of drag structures or of secondary faults crossing the main fault zone. 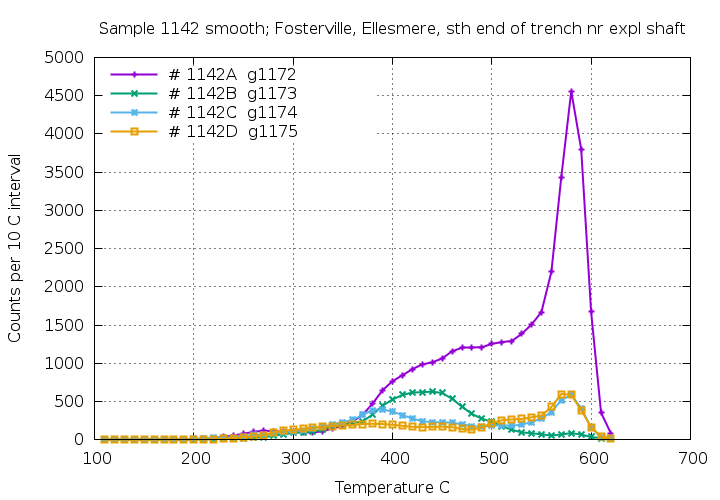 Periodic variation in the intensity of workings, and slight changes in strike suggest an en-echelon mineralization pattern in places. Other mine workings within the tenements are probably controlled by similar fault structures. 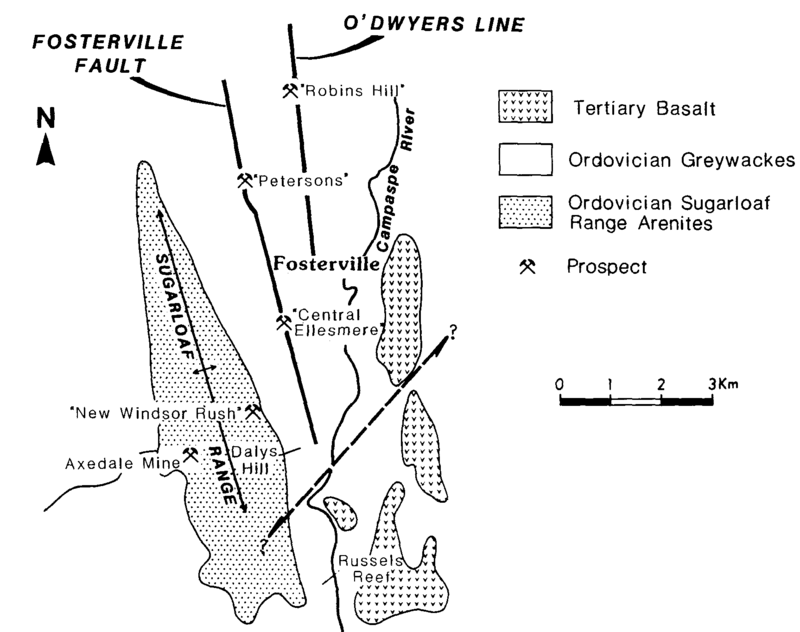 In particular an adjacent strike fault, sub-parallel to and approximately 1.5 km east of the Fosterville Fault, hosts the O'Dwyers Line of mineralization with intermittent mine workings over a strike length of 5 km. Patchy outcrops of Tertiary basalt and gravel, and extensive Quaternary alluvium, obscure outcrop over some of the tenement, especially along the Campaspe River. Gold mineralization along the Fosterville Fault Zone occurs in oxidized brecciated shear zones and associated quartz stockworks and silicified sandstones (Fig. 2) and has a strong geochemical association with arsenic. The mineralized fault breccia and associated stockworks are vertical to sub-vertical and are up to 30 m in width. Stockwork zones occur generally, although not exclusively, on the eastern side of the main fault breccia (Fig. 3). The mineralized zones were frequently wide and planar, but surface observations in conjunction with old mine data suggest that in some areas shallow plunging ore shoots were controlled by a combination of brecciation along the Fosterville Fault Zone, lithology, the effects of cross faulting and the possible presence of drag folds. Fig. 2 Fosterville fault zone - Petersen's prospect. Fig. 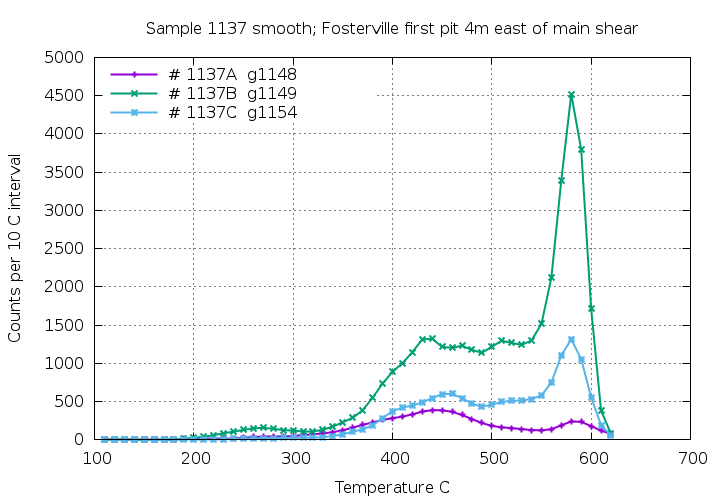 3 Fosterville Petersen's prospect, typical cross section. The original head grade of 3.5 to 4.5 g/t for most of the field in conjunction with current drilling indicates an absence of coarse gold. Early mining extracted ore around 6 g/t by underground stoping from shafts up to 45 m in depth with near-surface ore subsequently extracted by open stope and glory hole methods. A significant feature of this mining is the complete absence of mullock, indicating that all material mined was of ore grade. The most extensive workings and greatest gold yield along the Fosterville Fault Zone extended from Rae's Area in the north to Daley's Hill in the south, a distance of approximately 8 km with almost continuous workings over an aggregate distance of 3.4 km, the remainder of the field being obscured by soil cover. 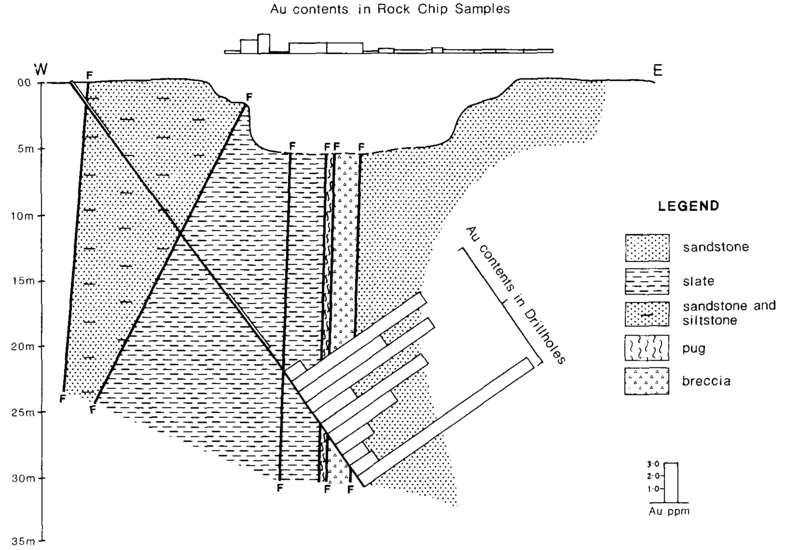 Programmes of rock sampling by Lone Star, Apollo, Noranda and BGL along the zone produced consistently anomalous gold values of from 0.1 to 9.0 g/t (average 2.0 g/t) in more than 100 chip and channel samples. A drill indicated resource in excess of 375,000 tonnes at 3.6 g/t has been outlined by BGL over an aggregate strike length of 800 m of the Fosterville Fault Zone. Similar styles of mineralization occur in apparently related sub-parallel structures within the tenements, the more significant being along the crest of Sugarloaf Range and the O'Dwyers Line (Fig. 1). Petersen's area contains good examples of the various styles of mineralization within the Fosterville Shear Zone. 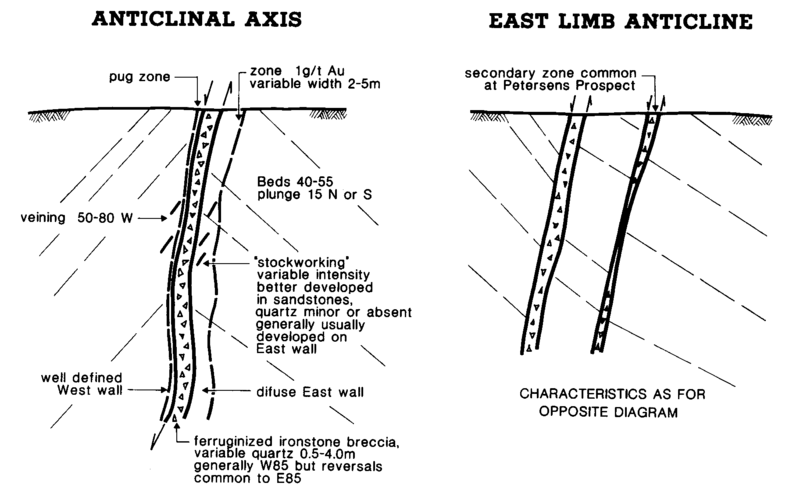 Shearing intersects both anticlinal axis and east limb anticline positions (Fig. 4). (i) Ferruginized ironstone breccia with variable quantity of quartz and a sharp, well defined western wall, sometimes associated with a narrow pug zone. (ii) Quartz stockworking of variable intensity, most commonly developed to the east of the major shear zone. Veining predominantly dips 50 to 80° west. (iii) Relatively broad distribution of gold in both drill hole intercepts and rock chip sampling in the vicinity of the major shear zone. 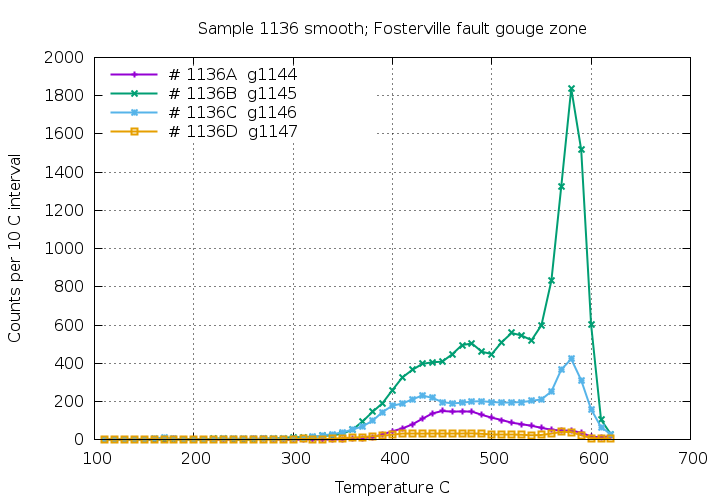 Fig 4 Simplified cross sections of typical Fosterville mineralization. The main point of interest in these results is the presence or absence of a low temperature decrepitation peak between 200 and 300 C. When present, this indicates that the inclusion fluids have high contents of CO2. Gold mineralization tends to be found in association with such CO2 rich fluid inclusions. Sample description information for all of these samples is here. 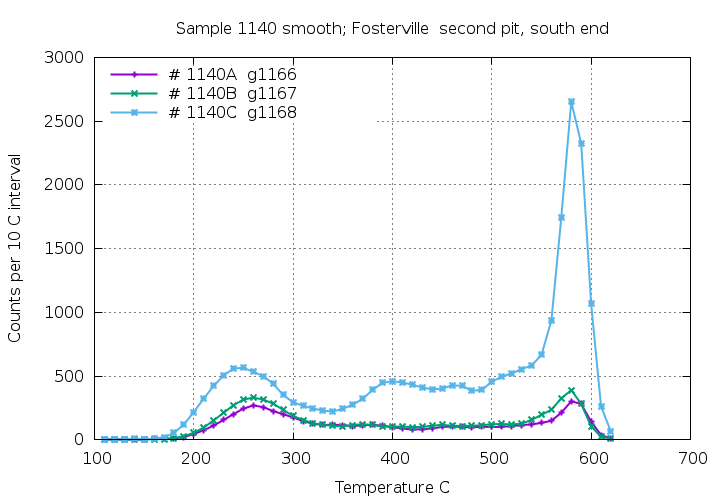 All 4 of the sub-samples of sample 1136 show no low temperature decrepitation. This zone of the fault is interpreted to be of low mineralization potential. Sample 1137, sub-sample B shows modest low temperature decrepitation caused by CO2 rich fluid inclusions. There are multiple generations of quartz at this location with some lacking CO2 bearing fluids. Sample 1138 sub-sample A has traces of CO2 rich fluids, but other samples from this location lack CO2 bearing fluids. 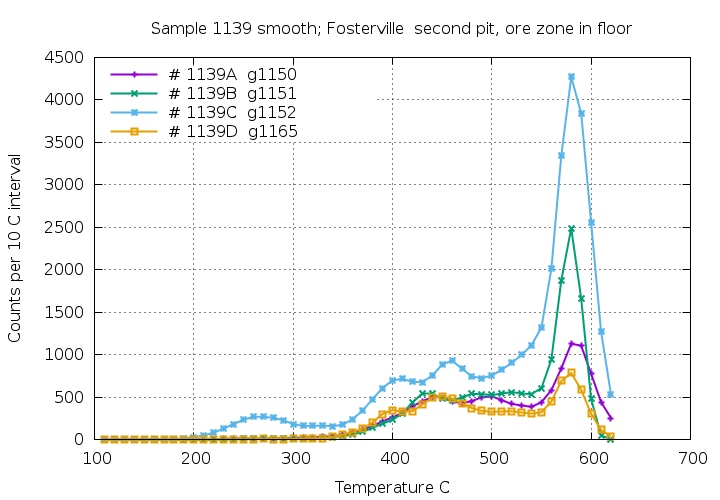 The 6 samples from Pit 1 show variable, mostly low contents of CO2 fluids. This area is interpreted to be possibly mineralized but of secondary importance. Sample 1139, sub-sample C shows decrepitation at 260 C due to CO2 rich fluid inclusions, but the 3 other nearby samples lack CO2 rich inclusions. 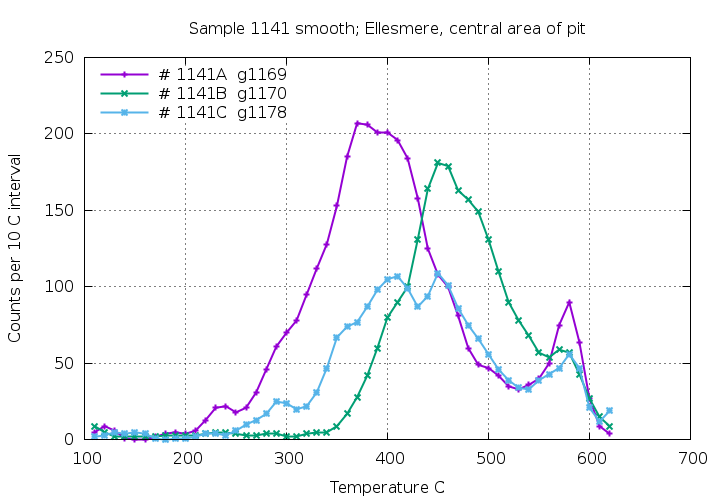 All 3 sub-samples of sample 1140 show significant low temperature decrepitation and CO2 rich fluids are common in this location. This is interpreted to be a highly prospective location for gold mineralization. Pit 2 shows many CO2 rich quartz samples, particularly at the southern end, and is a location of primary interest for gold mineralization. The 7 samples from this area show quite varied decrepitation patterns indicating that multiple different quartz generations overlap in this pit. 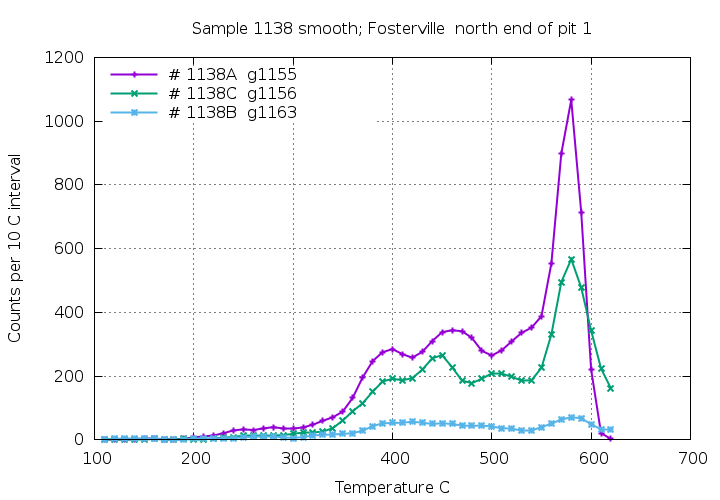 Two of the samples show the presence of CO2 rich fluids, primarily in sample 1142A. The Ellesmere area is of secondary interest for gold mineralization. In common with other areas of the Victorian gold province, CO2 rich fluids, as detected by low temperature decrepitation anomalies, are typically closely associated with gold mineralisation and these decrepitation features can be used as an exploration guide. An overview of using fluid inclusion decrepitation as an exploration tool for gold deposits is here.